For eight western U.S. states, this has been the warmest year on record through October, according to new temperature data released Friday, and several of those states are likely to continue that record to year’s end. 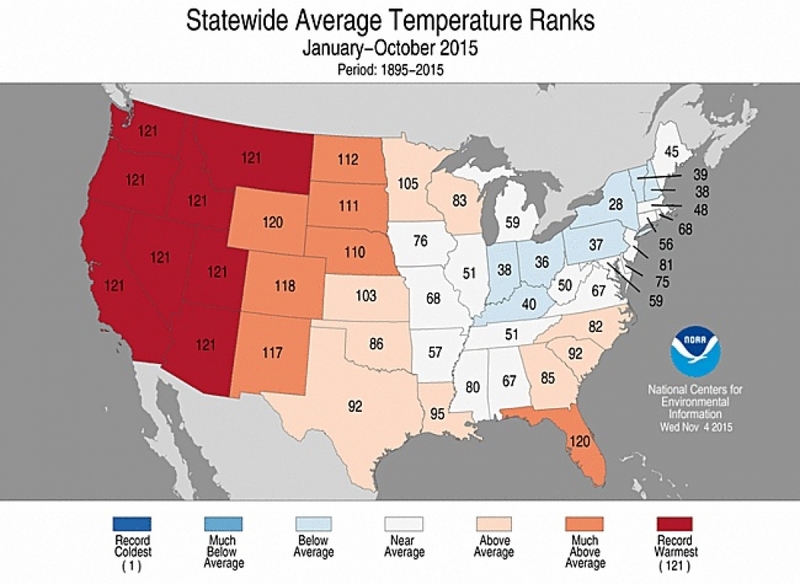 Where temperatures for each state ranked for the period from January to October 2015. The Lower 48 as a whole is also trending hot, and could see the year end up among the 10 warmest in more than 120 years of records. “I think that it is more likely than not that we will see a Top 10 warm year for the contiguous United States,” Jake Crouch, a National Oceanic and Atmospheric Administration climate scientist, said in an email. Those likely rankings very much fit with the picture for the globe overall in 2015, with this year likely to surpass last as the warmest on the books. That’s thanks in part to a strong El Niño as well as the heat that continues to accumulate in the atmosphere from the unabated emissions of greenhouse gases. NOAA’s temperature data compiled from around the country showed that October continued a stretch of unusual warmth across the western portion of the country that has been in place for more than a year. In fact, last year was California’s warmest year on record by a wide margin, and this year could give it a run for its money. Seven other states — Oregon, Washington, Idaho, Montana, Utah, Nevada, and Arizona — are also running record hot for the year so far. That heat has been due to a mix of factors, including a stubborn high pressure ridge that sat over the region for much of the year, as well as warm Pacific waters off the western coast (the two conditions are related). The strong El Niño has also acted to raise temperatures generally. El Niño is showing no signs of weakening and is likely to hit its peak in the next month or so, which could have mixed effects for the western states. But for the Pacific Northwest, El Niño tends to mean warmer-than-normal winter weather, which means it is more likely for them to continue to see their warmest year, he said. The warmth that has pervaded the West has helped to usher in drought. In California, drought has reached record levels and become deeply entrenched over the last four years. The high pressure hovering over the region kept it dry, and when storms did come through, the warm temperatures meant most precipitation fell as rain instead of snow in the mountains. That snow acts as natural storage that fills up reservoirs when it melts in the warmer months. The lack of snow was also felt up in Oregon and Washington, which saw drought blossom this year. El Niño will create a mixed bag in terms of precipitation too, with increased odds that Southern California will see more precipitation this year — though it’s too early to know if that will come in the form of snow — while the Pacific Northwest is likely to be drier and could see its drought deepen. El Niño also tends to bring warmer winter weather to the northern tier of the contiguous U.S. (and cooler and rainier weather to the Southern Plains and Southeast). The lower 48 states have seen their sixth warmest year on record collectively through October, with a temperature 2°F (1°C) above the 20th century average, so the likelihood that average will stay in the top 10 is fairly high with only two months left to go. 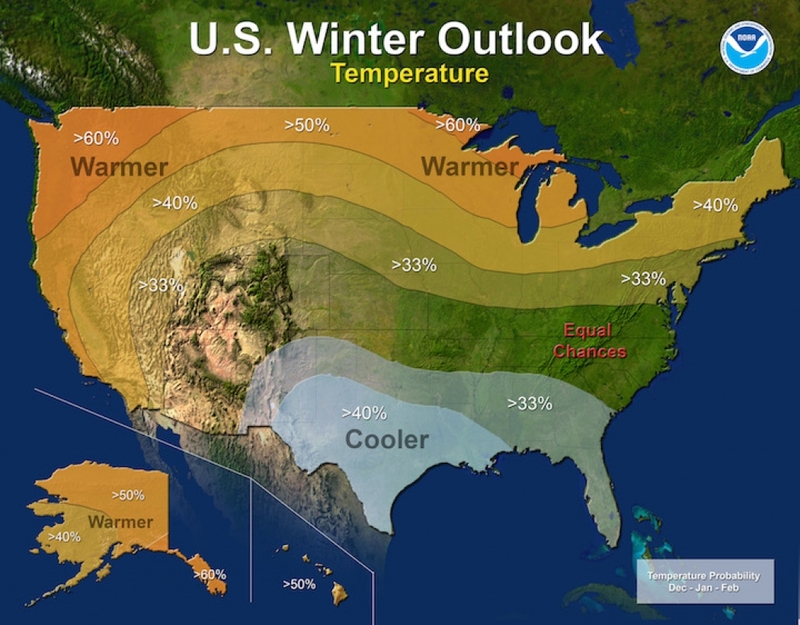 Areas of the U.S. where temperature is most likely to be above or below normal during the winter of 2015-2016. El Niño is also helping to push overall global temperature to uncharted heights, with 2015 ranking as the warmest year-to-date for the planet as a whole and very likely to stay that way. NASA and NOAA have independently set the odds of 2015 becoming the warmest year at 93 and 97 percent, respectively, with data only through the end of summer. It may seem odd to have the warmest year globally but not for the U.S., but the eastern U.S. was relatively cool over the first few months of the year. That has a bigger effect on the average temperature of the Lower 48 than on the globe as a whole because the region is a larger percentage of the former. If 2015 does come in as the hottest year in recorded history, it will displace the previous record set last year. It’s not unusual to have back-to-back record warm years when El Niño is in play, but that isn’t the only factor. The steady rise of Earth’s average temperature as more and more heat is trapped in the atmosphere is weighting the dice toward record hot. Thirteen of the 15 hottest years on the books have come since 2000, and the last time there was a record cold year was 1911.